Going through our archives, we came across this great post by Dr. AnnMaria De Mars from July 30, 2011 “Sorry my paper on data visualization is late, I was at a pow-wow” that we wanted to share in case you missed it the first time around. I was going to come back to the hotel after work and finish up my paper for the Western Users of SAS Software (WUSS) conference. This one is called Better-looking SAS for a Better Community. It was going to use the analyses I did of inequality in America and presented to urban Los Angeles middle school students this past year. However, another teacher asked me to do a presentation for his class, and he teaches in Missouri, in a school that is 95% African-American. The demographics being different, I thought a different presentation would be in order, so I am working on one called “A Study in Black and White”. So far, it’s coming out well. That was, until Erich, my former business partner, suggested I go to the pow-wow tonight. I weighed it – finish paper, go to pow-wow, Graph-N-Go , fry bread, SAS Enterprise Guide, Indian tacos, plots of predicted versus actual, fancy dancing. In the end, the pow-wow won out. The picture below is from what I thought was the coolest part which is the inter-tribal dance where everyone from all of the tribes comes out and dances, men, women, kids, shawl dancers, grass dancers, jingle dress dancers, traditional dancers and dancers I don’t know the name for. My reasoning was, how many times in life will I get to go to a pow-wow? The last pow-wow I went to was probably 18 years ago. On the other hand the last SAS program I wrote was last night. 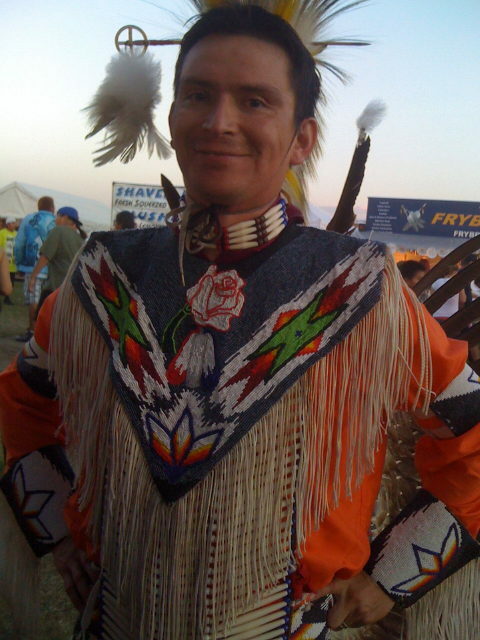 This is my partner’s nephew, whose father used to be the tribal council chairman. When he’s not dancing at pow-wows he’s in law school. I suspect a few years from now federal cases on tribal sovereignty might be a bit more interesting. Did I learn more from the pow-wow than doing my paper? Surprisingly, yes. I learned that the inter-tribal dance is gorgeous. I learned that there are more things in life than writing one more paper. Since I could not get Internet access, Cinch didn’t work, Twitter didn’t work, Facebook didn’t work. I learned that sometimes it’s good to quit recording things and just witness them. Oh, and Indian tacos are not very much like Mexican tacos but they still taste delicious and that tripe soup looks just like menudo and there is no way in hell I am eating either one. THERE’S STILL TIME TO SAVE 90% ON ALL GAMES THRU JULY 31! CLICK HERE FOR MORE INFO!